I used products to acquire & renew my HAZMAT. Created by & for CDL HAZMAT endorsed drivers. Click here to view The Trucker digital edition. Pam & I are pleased to announce the offering of the School Bus / CDL Class B Audio Test Prep. We were able to help new school bus drivers in 3 different states get their license prior to taking this product public and know we can help you too. Happy Independence Day to you and yours and thank you for all the support. Check out the CFI renewal temporary license I attained a little while ago on our about us page. Have a safe and happy Memorial Day. I renewed my TWIC a couple of weeks back. Besides the benefits associated with having it with my CDL it also serves as an ID when dealing with federal entities. 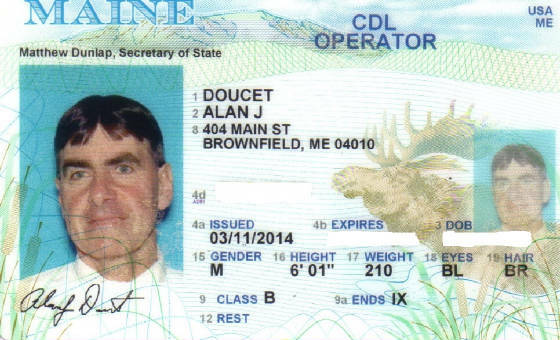 My state of Maine has not adhered to the Federal Real ID laws and a Maine issued driver's license cannot be used to get into federal buildings, military bases, etc. See my new TWIC below on this page. Here's another great question from one of you who has earned a HazMat endorsement using our products. Why should I get a TWIC? My answer, it's just a card that is attained by passing a background check and paying a fee but may be the one item between you and another candidate for work. It's your call but better to have it and not need it then need it and not have it. You can see my TWIC by scrolling down this page..
A Driver named Nick purchased our software and audio cd's last September and used them to add a HazMat and Tank endorsement "X" to his CDL license. Last week his dispatcher asked him to stop in the office and speak with the boss/owner. His boss informed him that they were reviewing all of the Driver's licenses and would require everyone that did not have a HazMat endorsement to acquire one within the next six months. Nick then produced his new License with the "X" endorsement explaining to his boss that he saw the direction the company seemed to be going in and wanted to be ahead of the situation. Nick also explained how he used our products and aced both tests he sat for. Steve, Nick's boss, called and actually thanked me for offering these products. He then ordered copies of our products for the remaining Driver's on his crew that needed to get the HazMat endorsement. So, thank you Nick and thank you Steve, these are the stories that makes all the hard work Pam & I do worth it. Thank you all for making 2015 a great year. We've taken your suggestions and made our products even better. I will need to go for my Medical Examiner's Certificate soon and as before I'll share my journey with you on our about us page. Our products have helped so many and it's been because many of you have helped by providing new ideas and letting us know what you liked and didn't like about our products. Again, thank you very much and keep the input coming. Today Pam & I want to thank Steven for asking a question that we missed about our CDL Audio Test Prep - Via Down-loadable link. This is a product that caters to individuals looking to acquire a CDL for the first time. He asked how large the mp3 files were so he could purchase a player appropriate for the files. The files total to 117.7 MBs but we suggest that you purchase a player with as much space as you can afford. Reason, you will be able to use it for other things such as music, books, etc. Great question and keep them coming. We've had a number of drivers call who wanted to order our products but did not want to use the website or pay with a credit card. No problem, first make the check or money order out to ADOS, that's out parent company that has been in existence since early 1990's. Next, mail payment with the state you will be taking the test in, your name, full address with zip code and include a phone number to discuss any possible confusion to ADOS, 404 Main St, Brownfield, ME 04010. The only concern we have is you need to plan for the time the mailings will be in transit. If time is short to prepare for the test using the website is your best option. Pam & I are pleased to announce that we we created an add-on to the CDL HazMat Test Prep Software. We've created the Audio CDL HazMat Test Prep which is included with the software at no additional cost. The Audio CDL HazMat Test Prep can be best described as a collection of audio flash cards. In creating this we attempted to accommodate the busy CDL professional who is on the road but still needs to prepare for the HazMat re-cert or initial test. The Audio CDL HazMat Test Prep is in the same 3 sections as the software allowing you to focus on area's by coordinating between the audio and the software.Again, the Audio CDL HazMat Test Prep is on CD and via down-loadable link with the CD being sent via USPS at no additional cost. This is something I truly wish I had during my preparation for my last recert test. Just another way we've made driving time study time. Alan called and said he needed to have a HazMat, Tank and Doubles/Triples endorsements for an employment opportunity. He asked if we could provide the doubles triples section with the HazMat Audio Study Guide. The answer is yes, going forward we will include as a free add-on the Doubles & Triples section with the HazMat Audio HazMat Study Guide in the download version only. We hope this will also help others become more competitive in the professional truck driving industry. Best of luck Alan. Thank you Daniel for giving us a heads up last week that our downloads were having issues. We were unaware of the issue and your making us aware of the problem allowed us to fix it quickly and kept the situation very manageable. Very few customers were affected and they have all since been able to download all the products they bought. Please let us know if our site is not performing as expected, we try to do our best and are very determined to give you great service. Thanks again Daniel. We would like to thank our customers for all the great questions asked about our products. Jack & Diane, yup we thought of the song too, asked why we don't say that the products we sell are up to date for the year 2015. Well they are and even better we review our questions and answers every 45 days. What many folks do not understand is that the federal government has a minimum set of standards/regulations for hazmat that every state must meet. This means that the state standards can be more demanding then the federal ones. These state regulations can change, and have, making the answer for the same question different in bordering states. So, with the self imposed window of 45 days, Pam and I believe we are always current with the latest and greatest hazmat test data. At the very least I prove to everybody that I've passed my last HazMat re-cert test! Always remember, adding a HAZMAT and or Tanker endorsement to your CDL only requires passing a written test, and a background check for the HAZMAT. This is probably the most cost effective way to increase your income as a CDL driver. Here is a question asked by someone thinking about buying our products. What does is take to have a HazMat endorsement placed on my CDL? The answer is you must pass your states administered HazMat written test and you must pass a background check. This is a great add-on endorsement because you can do it on your own and it opens up so many new opportunities. The one down side is you need to retest and pass the background check each time you renew your CDL. Also, think about adding the Tank endorsement to your CDL with the HazMat for an "X" endorsement like I have. This is included in our products for free. With Fall upon us many truck drivers are looking at adding a HazMat endorsement to their CDL for extra income. Good idea but before you invest in our products please check with your states regulations and back ground checks first. We want you to buy our products but you need to make sure you meet all the preceeding requirements before investing in our software and or audio hazmat study guide. Check out our About Us Page to see some of what I needed to do earlier this year to renew my HazMat endorsement. With August here Pam & I want to thank the folks at The Trucker for the great service they've provided to us in getting the word out about our products. Last August we placed an ad with The Trucker news paper and have been pleased with both the increase in sales it created and the new friends we've met from every state in our great country because of the ad. Please remember to always let us know how we can help you with your studies and how you did using our products. Thanks for using our products and stay safe. With the news full of security breaches where people have had their personal information compromised we've had quite a few inquiries into our security. Well, the only time we require your personal data is when you purchase our products. When doing this we use PayPal to take and process your data. Many who sell products over the internet find PayPal to be an expensive service. Maybe so, but they are very secure. We find that the peace of mind Pam, me and our customers get from our using PayPal is well worth the expense. Pam & I never see your credit card number or PayPal account number and we do not share any data that we do see. So rest assured that even though we are a small USA family owned business your data's security is of the highest importance to us. Well renewed my physical and I'm all set for the next 2 years. See my new Medical Examiner's Certificate on our About Us Page. Now it's time to go for my physical. I will share my experience much as I did while renewing my CDL. 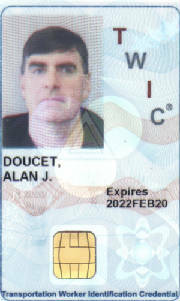 Well, finally renewed my License and my TWIC., as displayed by the above picture of my license. I used these products to pass the written test and aced the test in less than 10 minutes. Follow my journey as I renew my HazMat Certification on the About Us page of this website. We have added the Tank Section to our Audio HazMat Study Guide at no extra cost. By doing this the Test Prep Software and the Audio HazMat Study Guide are fully consistent with each other. Due to media limitations the Tank Section is only available within the down-loadable version of the Audio HazMat Study Guide. Don't test your knowledge on the ACTUAL TEST!!! As always, your suggestions and input for making our products better are welcome. My wife, Pamela and I developed a series of software packages for student pilots to pass the FAA written exams for Private Pilot, IFR Rating and the Commercial ticket. This has branched off into a series of new packages for student drivers to pass the written Learner's Permit/License test for a number of states. The Learner's Permit/License written test software packages are based on the Student Driver's Book provided by each state. 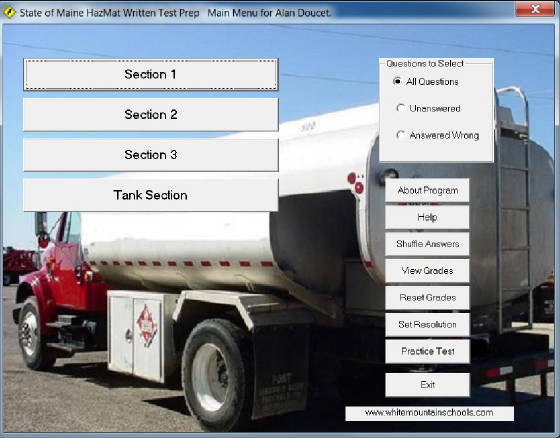 The latest additions to the series of test programs are the CDL and HazMat test prep software packages. The CDL manual for each state is used and referenced informing the user where the information can be found in that state's CDL manual, Section, Page and Paragraph. We look forward to providing you the best study software systems, bar none. Click picture for Limington Airport site. Pamela & Alan at the Limington airport. Acquired my TWIC to expand my HazMat options. 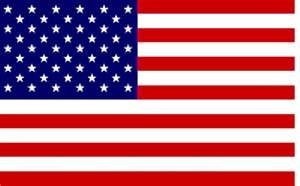 Made by Americans for Americans. Pamela and I are very proud of the products we have to offer you. This is a family owned and run business. When you call for help you deal with us. We will always treat you, our customers, the way we would want to be treated. Never think a question is a waste of time, the answer may be important for you to complete your goals. 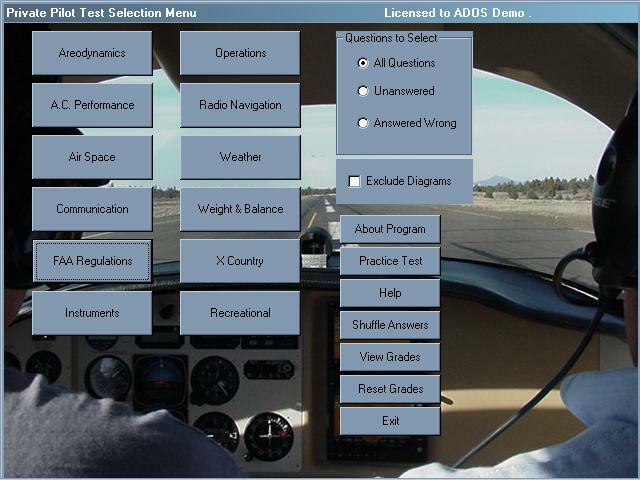 Test Prep main menu I used for my recertification. Main Menu for HazMat Test Prep software. Click the image to Buy Now. ADOS * 404 Main Street * Brownfield * Maine * 04010 Phone: (877) 885-7599.